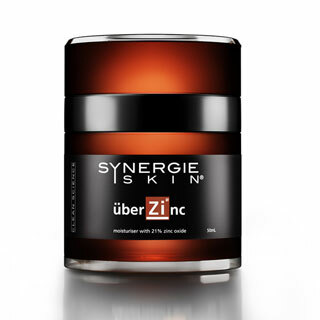 ÜberZinc Skin Moisturiser is a luxurious hydrating moisturiser formulated with over 20% pure zinc oxide for environmental protection against premature ageing linked to sun exposure. Pure green tea extract adds potent antioxidant properties. Your number one anti-ageing product. Non comedogenic formula. Hydrolysed tomato skin– a potent antioxidant . It is more powerful than green tea in its ability to neutralize free radical damage, which leads to ageing, and cell destruction.